Heat the oven to 250°. Cover a baking sheet with paper towels. In a large nonstick frying pan, heat 1 tablespoon of the oil over moderate heat. Sprinkle the fish with the salt and pepper. Put half the trout in the pan and cook for 2 minutes. Turn and cook until browned and just done, 1 to 2 minutes longer. Transfer the cooked fillets to the prepared baking sheet and keep warm in the oven. Add the remaining 1 tablespoon oil to the pan, cook the rest of the trout fillets, and add them to the baking sheet. Wipe out the frying pan and melt the butter over low heat. Add the sage and pecans and cook, stirring, until the butter is golden brown, about 5 minutes. Stir in the parsley. Serve the trout with the butter sauce spooned over the top. 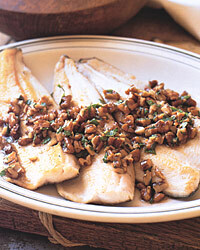 Fish Alternatives The combination of pecans and brown butter complements many kinds of fish, such as black bass, lake perch, or walleye. A full, luscious white wine will accentuate the deep nutty flavors of this dish. Look for an Australian Chardonnay, with its ripe fruitiness and toasty oak.